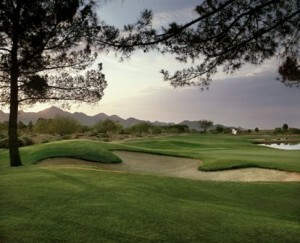 Arizona offers over 325 golf courses, but just as every PGA Tournament T.V. broadcast is built on the star-quality of the featured pairings, so is Arizona golf in the Phoenix-Scottsdale metro area. Each of the “AZGA Featured Foursome” golf courses exudes the glamor, the charisma and the flash that keeps Arizona golf on the front page. They have earned their place in the spotlight so step up, don shades for the media-glare if you wish and experience Arizona golf at its finest. Click on our Arizona Golf Course Reviews Guide List Directory to read the AZGA Player’s Review for every golf course in Arizona; visit www.arizonagolfauthority.com/coursedirectory. The Buzz: Of the 29 courses that make up the PGA Tour’s TPC chain, the TPC Scottsdale’s Stadium Course is generally regarded as the second-best behind the signature TPC Sawgrass in Ponte Vedra, Fla. But the Stadium also does something that even Sawgrass can’t do: provide plenty of seating for 100,000 fans in one day with its ubiquitous mounds that provide for a natural amphitheater on almost every hole. The Buzz: Randy Heckenkemper, who assisted Tom Weiskopf and Jay Morrish build the TPC Scottsdale – Stadium Course Course, returned solo to redesign the Champions Course in 2007. Heckenkemper’s redo turned out so well that many in the Valley of the Sun consider the Champions highest-value golf course in the Phoenix-Scottsdale area. Without a doubt it does deliver views, variety and plenty of value, coming in with a green fee that is less than half of the Stadium Course. Even though it’s tighter and shorter than its big sister, the Champions is no pushover, as evidenced by the fact that the Arizona State Stroke Play Championship is held there each year AND it gives the best amateurs in the state all they can handle. The Buzz: Tom Lehman has achieved a great deal in competition as a major champion, PGA Tour Player of the Year and Ryder Cup hero and captain. He continues to excel on the Champions Tour, but in recent years has also carved out a niche as an excellent course designer. That reputation is due in part to this country club gem. Lehman, who has worked on more than a dozen designs, prefers courses that test the full range of golf skills, and that is what golfers find at Encanterra. Befitting a British Open champion, Lehman says, “How the ball rolls is definitely part of the strategy of how the game is played. Golf is played as much on the ground as in the air.” That is the design approach he has taken and it shows in the courses he has created. After it opened in 2008, Encanterra was rated as one of the best new private courses in the country by Golf, Golfweek and Links magazines. Making it even more appealing is that, with its membership pricing, it is considered one of the best value private clubs in Arizona. 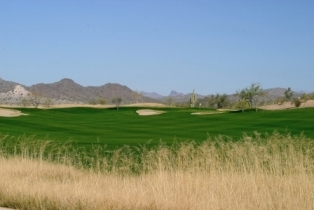 80-90 acres on most newer courses in the Phoenix area. And its positioning between the San Tan and Superstition mountains provides plenty of open air and stunning scenery. The Buzz: Fred Couples is the architect of record at this former all-men’s club near the small farming community of Maricopa even if most of the work was done by lesser-known architects Brian Curley and Lee Schmidt, a super-solid tandem that hails from Scottsdale. 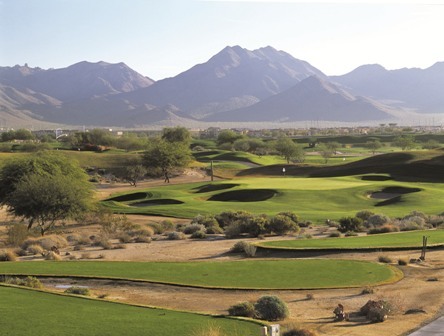 Located about 20 minutes south of Phoenix off Interstate 10, the original course ranged from 6,000 yards to a whopping 7,500 yards although a set of forward tees at 5,000 yards now exists. That’s more than you can say about the concept, as the guys never did have enough numbers to ultimately keep the gals out. Managed by Troon Golf, which does not oversee “average’’ golf courses, Southern Dunes is fun, fair, fast and furious. It’s also been the site of the first stage of PGA Tour qualifying on several occasions, as well as the host for local qualifying for the U.S. Open. The fairways are wide and rolling and lodged between the namesake dunes, while the greens are big and subtle with lots of bunkering. You definitely have to golf your ball at Southern Dunes, which is now owned by the Ak-Chin Indian Tribe (which also owns the Harrah’s Casino just a few miles down the road). The course never lets up, especially as it makes the turn, as the 11th, 12th and 13th holes are a great par 4, 3 and 5. Some feel the 18th, a sharp dogleg to a water-guarded green is the coup de grace, but the truth is Southern Dunes starts with a bang and the fireworks never let up, which is why several publications/websites have named it the fifth-best public golf course in Arizona – now that it’s public, that is. The Buzz: We can, and will, tell you plenty more, but here is all you really need to know about Trilogy at Vistancia: In 2009, it was the only public golf course in Arizona to receive a 5-star rating from Golf Digest, which is considered the utmost authority in that regard. The designation is determined by combining the opinions of official Golf Digest raters with those of the golfing public. How does the magazine define 5-star? “Superb. Golf at its absolute best. Pay any price to play at least once in your life.” Just 23 courses received that ranking in 2010, including the likes of Pebble Beach, Bethpage Black, Bandon Dunes and TPC Sawgrass. Need we say more? Probably not, but with this course there is plenty to discuss. The par-72 layout, which plays at 7,259 yards from the tips, is among about 20 designed in Arizona by Gary Panks but the only one to be inspired by a hunting trip. During that trip to southeastern Arizona, near the Chiracahua Mountains, Panks found a blend of blue gramma, weeping love and sand-drop grasses he had planted at Vistancia to perfectly accentuate the rolling terrain and sprawling White Tank Mountains in the distance. The long, wispy grasses in the rough and transition areas bring a Scottish look and feel to the course that is obviously one of Panks’ finest efforts because it combines quality design – one that offers playability and tournament toughness — with picturesque surroundings and in a way that preserves the natural values of the property. Vistancia, the centerpiece of a 7,100-acre master-planned community, features more than 70 bunkers, an unusually high number for a Panks design, but they are strategic rather than the type of endless bunkering that can turn a golf round into a nightmare. Adding to its appeal is a classic finishing stretch with four of the last five holes offering potential birdies. That includes two par-5s that are reachable in 2 shots, a drivable par-4 and a picturesque par-3 protected by a small lake on the right front. Typical of the added touches is the fifth hole, the longest on the course at 597 yards, where a sculpted mound near the front of the green perfectly mimics the mountain that serves as the backdrop. “We didn’t try to do anything tricky with the design,” Panks said. “I don’t like making people guess — just present a target and let them go after it whatever way they feel is best.